President Trump suddenly seems eager to answer questions from the media, even from outlets he demeans as "fake news." Trump has held four press availabilities in the past two days. And on Friday evening he announced that "we're going to have a pretty big press conference on Monday." This is an abrupt change in the president's press strategy. 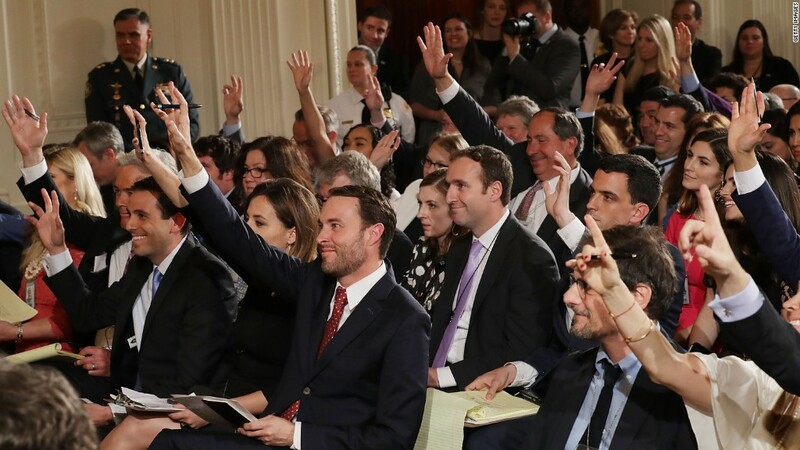 Trump hasn't held a solo news conference since February 16, and he frequently passes up on other opportunities to answer questions from the White House press corps. But not anymore. He fielded questions from reporters twice on Thursday and twice again on Friday, at various locations at his private golf club in Bedminster, New Jersey. CNN's count of the transcripts showed that he took more than 50 questions in total. A White House aide, when asked if this was the emergence of a "new Trump," said no, this is "vintage Trump." Indeed, his availability harkens back to the days of the Republican primary campaign, when he spoke with and occasionally sparred with interviewers on the trail. The White House aide, explaining the president's newfound availability to the media, said Trump has enjoyed being outside Washington and has entered into a comfortable working relationship with new Chief of Staff John Kelly. There may be other reasons as well. A senior White House official said Trump wants his voice to carry the administration's response to rising tensions with North Korea -- feeling it is important for the world and North Korea to understand his seriousness on the matter. But the official also conceded that the president is in his element at Bedminster, and finding his old habits of engaging with the media in this familiar setting. Trump's first Q&A was during the open-to-press portion of his lunch with Vice President Mike Pence on Thursday. Trump then took around 20 questions during his security briefing on Thursday afternoon. "With that, if you have any questions," he said before the prolonged availability. On Friday, Trump took four questions during a briefing on work force development with Education Secretary Betsy DeVos and Labor Secretary Alex Acosta. And hours later, on Friday afternoon, he took at least 19 questions on the steps of the conference center at his private golf club after meeting with Secretary of State Rex Tillerson, UN Ambassador Haley and National Security Adviser H.R. McMaster. "So, if you have any questions, go ahead," Trump said to kick off the session. He made lots of news, as he always does. Among the headlines after the Friday afternoon Q&A: Trump "not ruling out military option in Venezuela" and "Trump warns North Korea against making 'overt' threats." As for the Monday press conference the president mentioned, there were no immediate details given. Trump's lack of solo press conferences to date is a break with 64 years of presidential precedent. CNN's Jeremy Diamond contributed reporting. A version of this story first appeared in the "Reliable Sources" newsletter. Sign up here!